This part of the Go Bookshelf tutorial shows how to create a sign-in flow for users and how to use profile information to provide users with personalized functionality. By using Google Identity Platform, you can easily access information about your users while ensuring their sign-in credentials are safely managed by Google. 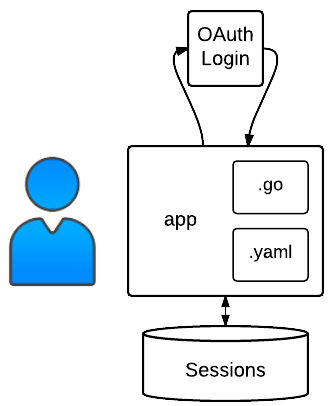 OAuth 2.0 makes it easy to provide a sign-in flow for all users of your app and provides your application with access to basic profile information about authenticated users. A web app client ID lets your app authorize users and access Google APIs on behalf of your users. In the Google Cloud Platform Console, go to Credentials. Click OAuth consent screen. For the product name, enter Go Bookshelf App. For Authorized Domains, add your App Engine app name as [YOUR_PROJECT_ID].appspot.com. Replace [YOUR_PROJECT_ID] with your GCP project ID. Fill in any other relevant, optional fields. Click Save. In the Application type drop-down list, click Web Application. In the Name field, enter Go Bookshelf Client. In the Authorized redirect URIs field, enter the following URLs, one at a time. Copy the client ID and client secret and save them for later use. Replace "clientid" and "clientsecret" with the client ID and client secret you created previously. Edit app/app.yaml. In the OAUTH2_CALLBACK environment variable, replace <your-project-id> with your project ID. Note: If you're using Cloud SQL, you will need to start a Cloud SQL Proxy. Now you can browse the app's web pages, sign in using your Google account, add books, and see the books you've added using the My Books link in the top navigation bar. Press Control+C to exit the local web server. The following diagram shows the application's components and how they connect to one another. Before your application can authenticate users, you need a way to store information about the current user in a session. The Gorilla web toolkit includes a Store interface, which includes several implementations. The CookieStore implementation stores session data in a secure cookie, and the FilesystemStore implementation stores session data on the file system. Storing session data on the file system is unsuitable for an application that can be served from multiple VM instances, as the session that is recorded in one instance might differ from other instances. For this reason, the Bookshelf sample uses encrypted cookies (CookieStore). The encrypted session data is stored in the user's browser and can be decrypted by any instance running the application code. The CookieStore implementation can be used in production environments where you have deployed multiple instances of your application, but be aware that users will lose their session information when they close the browser. // Update "something-very-secret" with a hard to guess string or byte sequence. Authenticating the user involves two basic steps, which together are called the web service flow. Redirect the user to Google’s authorization service. Process the response when Google redirects the user back to your application. // loginHandler initiates an OAuth flow to authenticate the user. // Use the session ID for the "state" parameter. // This protects against CSRF (cross-site request forgery). // See https://godoc.org/golang.org/x/oauth2#Config.AuthCodeURL for more detail. The first parameter of the AuthCodeURL function is the state parameter. This is used to keep the sign-in process secure by preventing cross-site request forgery. Your application redirects the user to the generated URL. The user is prompted to allow your application to access the scopes you specified. After the user accepts, they are redirected back to your application. // information and stores it in a session. // Validate this callback request came from the app. // Strip the profile to only the fields we need. Otherwise the struct is too big. Because the profile information is stored in the session, it can be retrieved by the application without fetching it again from the Google+ API. // profileFromSession retreives the Google+ profile from the default session. // Returns nil if the profile cannot be retreived (e.g. user is logged out). // information to the base template. Now that you have the signed-in user's information available through middleware, you can keep track of which user added which book to the database. // from the currently logged in user (or mark as anonymous). And because that information is stored in the database, you can show the user which books they have personally added. This code uses a database method called ListBooksCreatedBy. The implementation depends on which database backend you chose. In Cloud Datastore, you need to create additional indexes for a query that filters over more than one field. This query, in the ListBooksCreatedBy function, filters over both CreatedByID and Title. // the user who created the book entry. # This index enables filtering by "CreatedByID" and sort by "Title".